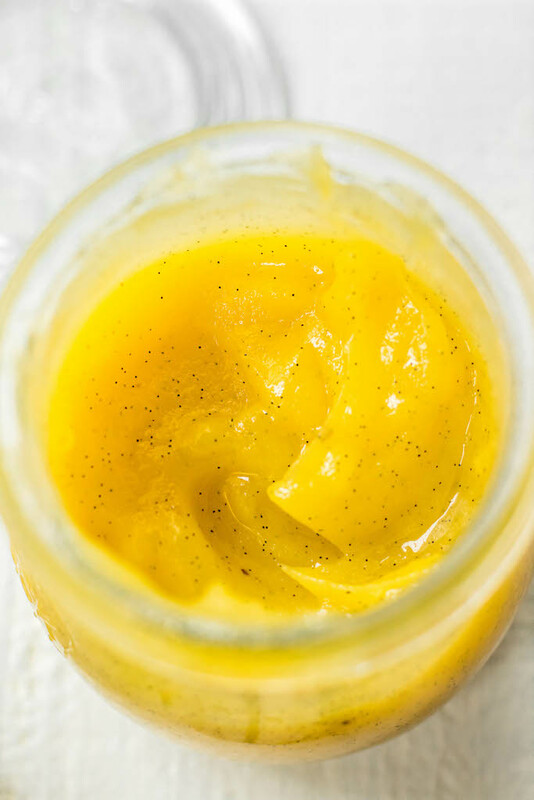 Ghee is a great staple for Paleo, Whole30 or Keto because it offers quality fats, a rich butter flavor but without the dairy! 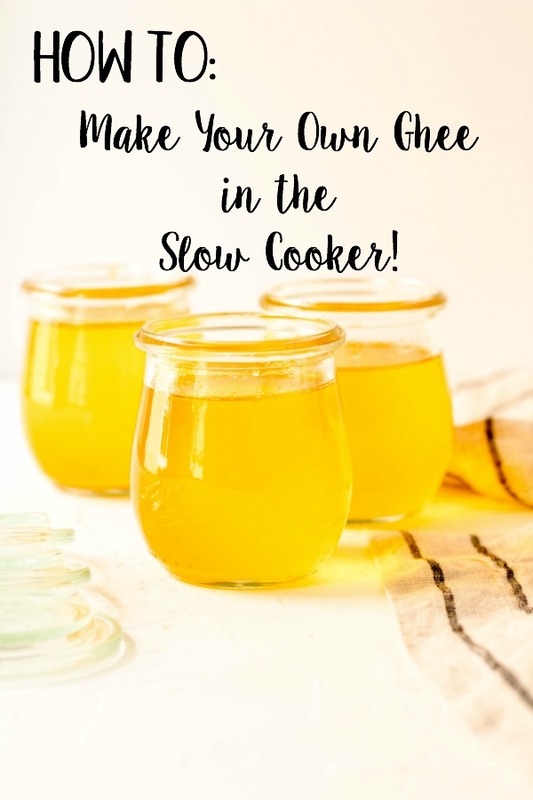 This DIY slow cooker homemade vanilla ghee recipe is a really budget friendly option, espeically where vanilla ghee is concerned. Vanilla ghee is popular for being used in morning bulletproof coffee for the hint of vanilla flavor, and this option gives you that without the price tag! I just truly can’t spend $14.99 on a 9 ounce jar of butter. I just really can’t get myself there, and yes I know it’s delicious. The reasoning behind that hard no for me is because I use ghee so much. Every day and often multiple times a day, like in my coffee and then cooking eggs or roasting veggies. I would go broke at that price. Just being honest here. Then I thought about it and realized I know how to make ghee in the slow cooker, instant pot and the stovetop, I know it’s much cheaper, makes a ton more, and most people have access to vanilla beans or vanilla bean powder. It was one of those moments I felt really dumb for not having made a DIY flavored ghee before. Ghee is probably my favorite thing in my kitchen to cook with and to put into my coffee (bulletproof coffee!). It’s clarified butter, meaning the butter has been cooked down so that the milk fats separate from the liquid solids. The milk fats are then removed, leaving the new product – ghee. 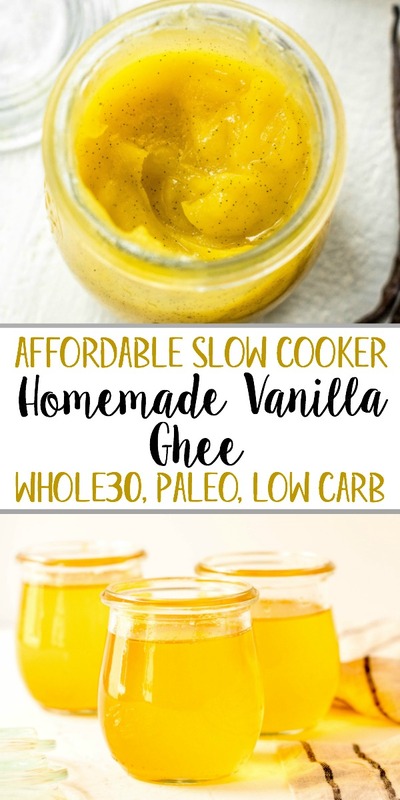 Ghee is considered a lactose free butter option and is a great Paleo and Whole30 substitution. I use it to cook eggs, make creamy buttery sauces, put on baked or mashed potatoes, roast veggies, make butter sauce for seafood or steak.. really, you name it. Whatever butter can do so can ghee! You can totally buy ghee in stores. Almost all stores nowadays actually! Target, Whole Foods and Walmart all carry my favorite non-homemade (not vanilla) brand Organic Valley, and Fresh Thyme carries their own brand I like. I also love the Thrive Market ghee and keep it on hand quite a bit. Check this post for all of my Whole30 Shopping Lists for these stores and more! Back to the budget issue, making your own really is much more affordable. I use a pound of Kerrygold butter from Costco for $11 and got 3 of these 8 ounce jars worth. I didn’t fill them all the way being I left space at the top, but you get the point. It’s a much more affordable option. Vanilla bean, in the bean form can be a bit pricey but a little goes a long way. 1 vanilla bean equals 3 teaspoons vanilla extract. That means that 1 bean would be plenty for 1 pound of ghee, and you could cut the vanilla bean in half if you are wanting to use less than 1 pound of butter. Going the vanilla bean route, the cost breakdown is about 4 dollars of vanilla per 1 pound of ghee. I’d recommend getting this one, or ordering from a spice shop before getting them from Whole Foods, although that’s an option as well, just more spendy. 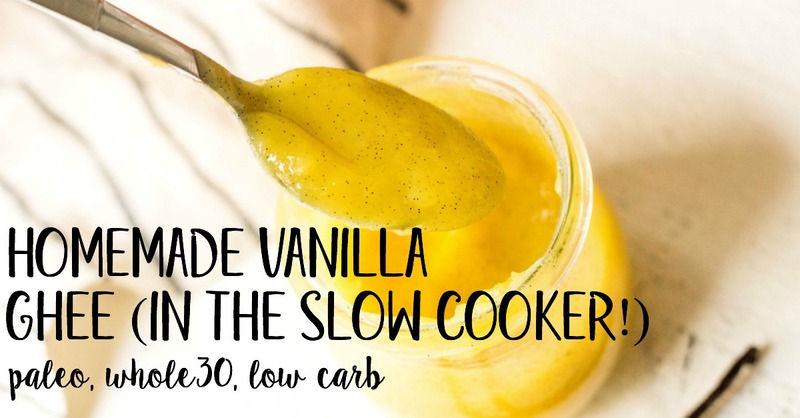 Alternatively, you can use vanilla bean powder instead of getting the bean whole for this slow cooker homemade vanilla ghee. Vanilla bean powder is going to be more expensive than the bean, but you get more in the package for other uses. I personally really prefer the actual bean myself, but if you have vanilla bean powder at home, I want you to know that works too! Vanilla is one of the most expensive things to source, especially when pure and not mixed with sugar alcohol. If you’re using vanilla bean powder, you’ll use 1/8 teaspoon for every 8 ounces of butter. 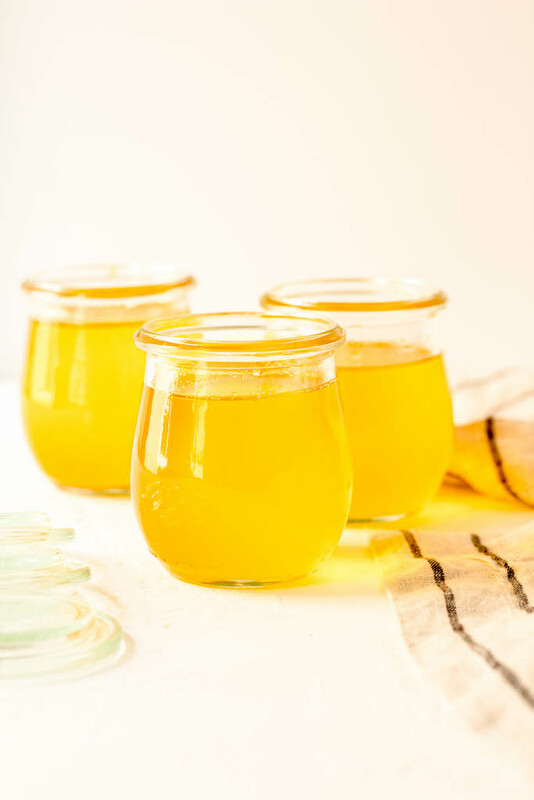 To make your own homemade ghee, or, in our case vanilla ghee, you’ll need a slow cooker, cheese cloth and some glass jars that have lids and can be stored in the fridge. Weck glass jelly jars are my favorite jars ever for ghee, and homemade sauces and dressings. If you don’t have cheese cloth but you do have a nut milk bag, you could use that instead. 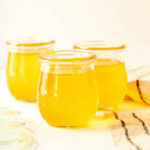 You’ll also need a funnel or large measuring bowl with a spout that you can use to pour ghee through the cheesecloth and into the jar. You’ll cook the ghee into the slow cooker on low for 3 hours, or until the milk solids fall to the bottom and turn brown. It will be done when that happens, and when it’s not bubbling as quickly as before. You could also boil on the stovetop, but slow cooker ghee is my favorite method. You’ll want to let the ghee cool in the jars and begin to solidify prior to putting into the fridge. Once it’s soft but not solid is when you’ll want to mix in the vanilla. If you mix it in too early the vanilla bean will sink to the bottom and only be in the bottom of your ghee. When it’s soft you can make sure you evenly distribute it. You can also decide to only put vanilla in half of the batch of ghee here, so you end with some regular homemade ghee and some homemade vanilla ghee. You do not have to keep opened ghee in the fridge. You can store it in a cabinet away from the light for up to 3 months, then after that it’s good in the refrigerator for up to a year. This is where you should store the extra ghee (the jars you aren’t currently using yet) until you need them. Ghee will become hard in the fridge, but will soften again once it’s at room temp. 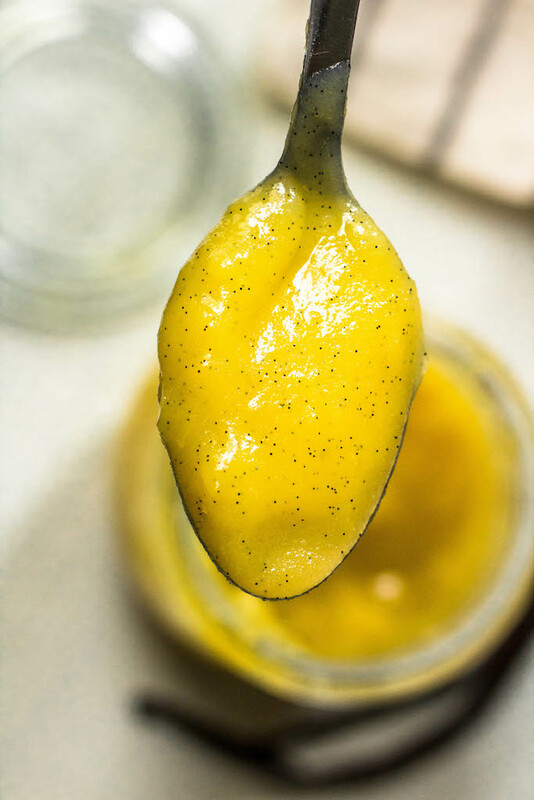 Ghee is a great staple for Paleo, Whole30 or Keto because it offers quality fats, a rich butter flavor but without the dairy! This DIY ghee recipe is made easily in a slow cooker. 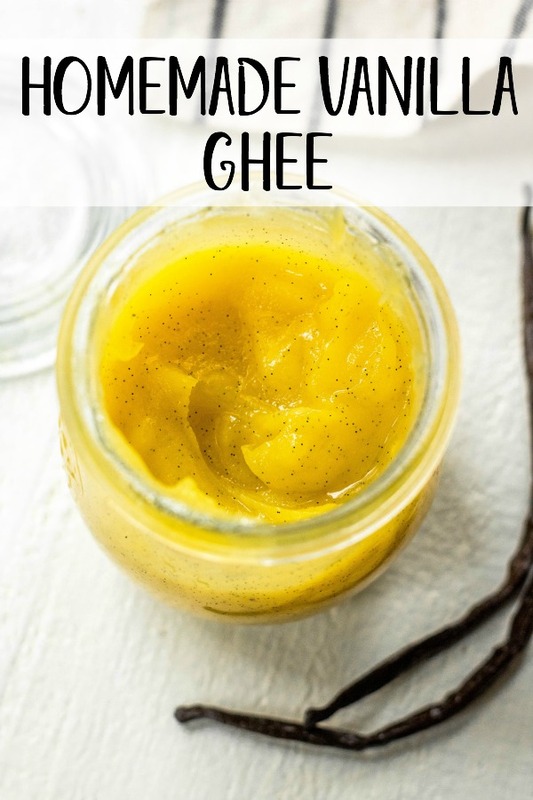 Homemade ghee is a really budget friendly option, espeically where vanilla ghee is concerned. 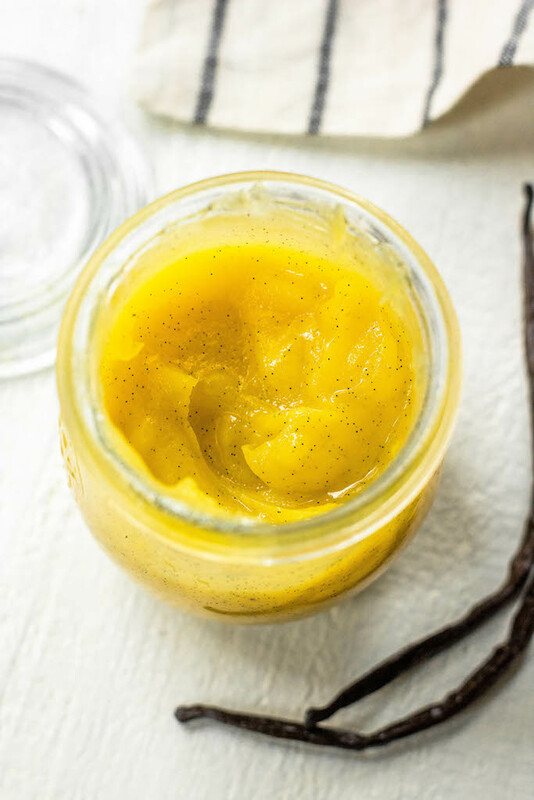 Vanilla ghee is popular for being used in morning bulletproof coffee for the hint of vanilla flavor, and this option gives you that without the price tag! Once no ghee is left in the slow cooker and jars are filled, cover and let cool for about an hour. 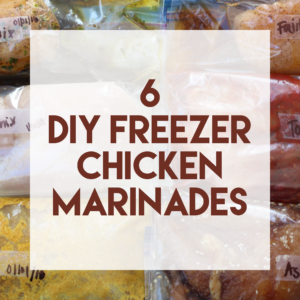 Refrigerate jars you won’t be using right away and enjoy! 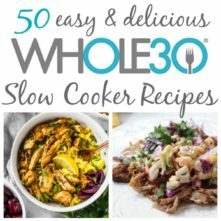 This slow cooker ghee recipe may contain some links that are affiliate links, though products are ones I use personally and recommend. When you purchase anything using my links, it costs you absolutely nothing extra, but it does give wholekitchensink.com a little financial support which helps to keep this blog running. Thank you for your continued support, both with your dollars and your interest. Hi Bailey! You are an amazing inspiration and I look forward to trying some of your recipes! I have a question, why unsalted butter to make ghee? Does it really make a difference or is it just a preference? I’ve been making my ghee with salted butter, I just never liked unsalted butter because it tastes like unflavored oil. Thank you. 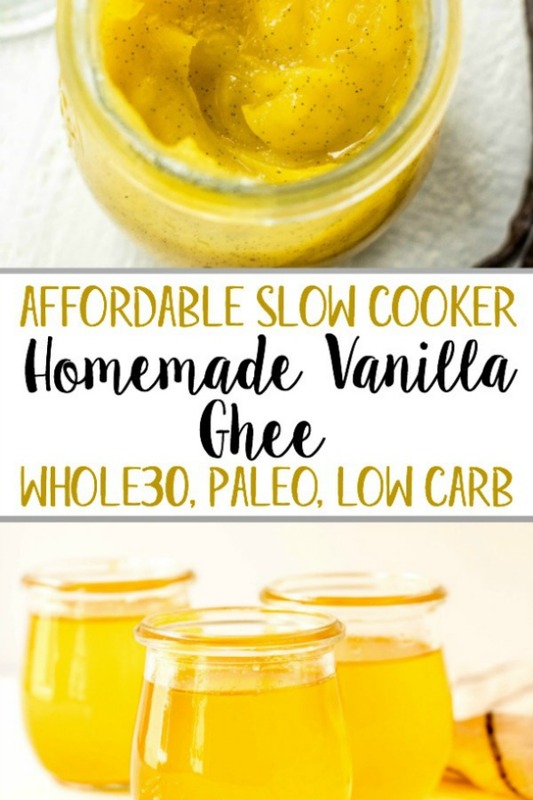 Great idea making ghee in a crock pot. Thanks! Made this today and it tastes just like the 16 dollar jars i (used to) buy and the ingredients are exactly the same! You’re the real MVP! Thank you! YES! So, so happy you have a more affordable option! Thanks for letting me know you loved it! Hey! 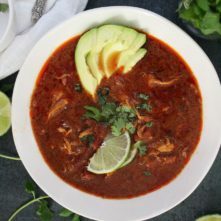 You totally can do it in an instant pot! The slow cooker function would be fine, but I think it auto-sets to 4 hours so you may have to manually turn down the hours so the ghee doesn’t burn. I’ve also made it in the Instant Pot by just keeping it on saute mode for about 40 minutes and keeping the lid off! Hey there! I layered my cheesecloth a bunch of times, but milk solids still came through. I finally rinsed the cheesecloth and used it damp, and that seemed to work. Did I miss something or do I just need more cheesecloth and a turkey baster? Thanks! Hey there! You didn’t miss anything 🙂 Sometimes if cheesecloth is thinner it needs to be strained through twice! Awesome, thanks! We’re making a second batch today, so I’ll try more cheesecloth???? So, I have a fairly only vanilla bean that I was thinking about just opening and putting in the slow cooker with the butter. (I only want to make vanilla ghee.) Did you ever think about incorporating the vanilla in while it cooks or have you tried it? I was also thinking that I could scrape the bean before adding it and then stirring in the beans when it’s slightly cooled so it’s more evenly distributed. What do you think? Adding it while it cooks doesn’t work as well because of the way the butter milk fats/solids separate while it cooks. A lot of it sticks and browns on the bottom, and then the top layer separates as well so when you go to strain the ghee all of the vanilla bean will get caught in it and not make it through into your finished ghee. As far as stirring it in when it’s slightly cooled, that’s exactly how it’s done! 🙂 The recipe says to wait until it’s soft but not liquid anymore then add in the vanilla seeds :)) Let me know if you have anymore questions! Good to know! Thanks! I’ll be sure to follow your directions re scraping and when to stir it in. I may live life on the edge and throw the empty pod in the slow cooker with the butter and just see what happens. Oh and secondary question. I have some butter that is not grass fed. insert gasp. and i’ll definitely buy some next time i’m going to make ghee. but I have it and I’m not thrilled about throwing it away if I can turn it into liquid vanilla gold. Loved the recipe and the method. Worked flawlessly for me. Doubled the recipe the second time I made it to give as gifts for my Whole30 friends in my book club. Thank you! Great to hear! Love the gift idea too! Thanks, Rachel! I made the recipe! Aside from having issues with the cheesecloth and having to order another one for the next time I do this I was really happy with the outcome. The only difference from using 4th and Hearth Vanilla ghee was that this wasn’t as Vanilla-y, so next time I might add two vanilla beans. Hey there! Sorry I’m just seeing this! I’m glad you’re happy with it! One thing you can do is always add additional vanilla after it’s been made. Just allow to come to room temp or warm slightly (not solid) and stir in more. Also, the longer the ghee sits the stronger the flavor becomes so that helps too! Thanks, Bridie! Rather new to whole30 and ghee. I have used regular ghee and want to try to make my own. I may also try to make 1/2 vanilla ghee. Forgive me, but what would I use the vanilla ghee on? Sweet potatoes? Does it have a real vanilla flavor? Sweet potatoes would be great! I like it on roasted carrots as well. A lot of people put it in their coffee for butter coffee or bulletproof coffee. It does give it a good vanilla flavor! I would love to make this but I don’t have cheesecloth. Do you think a nutmilk bag would work instead?